Photo by Darren O'Brien/Guzelian Picture shows Visitors look at Face to Face, 2013 by Anthony McCall, The Hepworth Wakefield, Wakefield. The exhibition Anthony McCall: Solid Light Works opens 16 Feb - 3 June 2018 at The Hepworth WakefIeld. 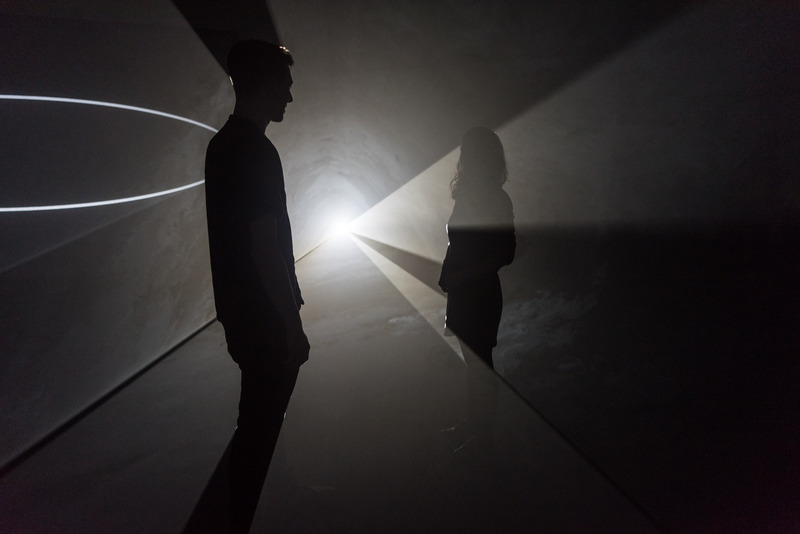 Anthony McCall’s first major UK retrospective at The Hepworth Wakefield includes three ‘solid light’ installations works from 1971 to the present day. Entering Gallery 7 the visitor is plunged into an unnerving blanket of blackness. It is almost as though you have been forced to shut your eyes, only to open them in the same thick darkness. Although aware there are others around who are participating in the same experience, there is an eerie sense that one is alone – like a child who shuts their eyes stood in the middle of a room and believes they cannot be seen. This sensation is ruptured when someone breaks a beam of light, casting shadows, not just upon the walls, but within the stream of light too. In Gallery 10, the shape-shifting juxtaposition of light and dark, substance and shadow excited a group of children playing hide and seek in the empty space. Light became the ‘object’ to hide from, revealing the real space. The crisp channels of light expose their own immateriality in this darkness. Stepping into a stream of the light, one is consumed by it. In ‘Leaving (With Two-Minute Silence)’ (2009) you are utterly surrounded by the light, walking as though through a tunnel. The light seems to form a solid wall and it is easy to stretch out a hand to feel it, only, of course, to grasp at nothing. In the past, as McCall explains in the exhibition video, cigarette smoke was enough to enable the works’ visibility, but now, without the natural dust, the beams would be unseen. The illusory solidity of the light’s curved walls raises a question about density, as one’s body becomes a silhouette amidst these dust particles. The dust also reveals the movement of Solid Light which, however solid they seem, never appears inert, even in the still and silent pause of the work ‘Leaving’. In the silence, the sound incorporated in this work (a barely audible soundscape of city and sea) is both anticipated and missed, so that any noise (including visitors’ voices) cuts the silence in a way not dissimilar to the beams cutting the black. The necessity of dust for the work shows that the light projection’s journey to the wall is no less important than its shape upon the wall. This interest in a journey is apparent in the heart of the exhibition space, which displays meticulous plans and diagrams. The expanse of drawings and models, with multiple versions over different dates, suggests a work is not the end of a process, but part of it; an interaction with its own planning, making and receiving. ‘Five Minute Drawing (Orchard Space, New York, 2008)’ (1974) shows this too. Installation drawings of two other light pieces ‘Between You and I’ (2006) and ‘Crossing’ (2016) emphasise the exposure of such performance, with light shining vertically on people that is reminiscent of both interrogation and theatrical spotlights. Exiting the exhibition and stepping out of the Hepworth into the brightness of day, exaggerated by the river, leaves one feeling stunned and strangely naked, as though leaving one’s silhouette and shadow behind. Anthony McCall: Solid Light Works, The Hepworth Wakefield, 16 February – 3 June 2018.